Hard Rock Hotel is a resort in Batu Ferringhi. Located near the western end of this popular beach, the 4-star hotel features a water park with kid-friendly swimming pools, water slides and splash pads. The hotel has three major restaurants: Hard Rock Cafe, Starz Diner and Pizzeria. Hard Rock Cafe is where the brand all started (in the United Kingdom, despite being an American brand). The restaurant's ambience revolves around rock and roll theme. Numerous pieces of musical memorabilia are prominently displayed throughout the 2 floors. Under the fancy chandelier is a small stage where live music is performed every evening. From 2 October 2017 to 12 November 2017, Hard Rock Cafe is launching a corporate-wide initiative called Vegetarian Awareness Month. A menu of 5 vegetarian dishes is prepared to raise awareness on the health benefits of a meat-free diet. The most popular choice is the Spinach, Potato & Chickpea Burger (RM35.00). As the name implies, the 6-ounce patty is made from spinach, red skin potato, chickpeas and spices. Also sandwiched between two halves of a burger bun are arugula (rocket salad) and cucumber slices that resemble cheese. Steak fries and spicy yogurt sauce are served on the side. My personal favorite dish this evening is the Grilled Ratatouille Wrap (RM33.00). Ratatouille is a traditional French dish of vegetables like eggplant, squash, tomato, onions and arugula. Sautéed with olive oil, the vegetables retain their natural sweetness and crunchiness. The vegetables are wrapped in flour tortilla and then dressed in spicy mayonnaise. The ratatouille also comes with a bowl of garden salad, comprising of fresh vegetables like onions, carrots, arugula and red leaf lettuce. Croutons are also thrown into the mix. Diners can also request for homemade salad dressings like balsamic vinaigrette, honey mustard and Thousand Island dressing. Camp Hispanic fields another finger food called Sweet Potato And Black Bean Tacos (RM33.00). This dish features three pieces of corn tortillas, which are reasonably firm but not quite as crispy as hard-shell tacos. Inside each taco are sweet potatoes, black turtle beans, cabbage, guacamole, feta cheese and chili sauce. There is also a bowl of salad on the side. Using flour tortilla, the Grilled Hummus Quesadillas (RM35.00) is filled with spinach, sun-dried tomato and black olives. The vegetarian quesadilla also contains garlic and herb hummus; the latter is easily mistaken as guacamole. Spicy sauce gives a sharp twist to this snack. Again, a bowl of vegetable salad is provided. Moving on, Quinoa And Arugula Salad (RM35.00) is one of the healthiest choices this evening. Quinoa is an edible, cereal-like crop from South America that is rich in protein and dietary fiber. The salad also contains arugula, candied pecans, sun-dried tomato, chopped coriander and shredded Brussels sprouts. Grated feta cheese and tangy citrus vinaigrette assimilate all ingredients together. The bar at Hard Rock Cafe is stocked with numerous labels of wines and spirits. Draft beers like Carlsberg, Asahi and Hoegaarden come in handy as Oktoberfest is just around the corner. The bar has also shortlisted a handful of cocktails to go with this month's vegetarian menu. The first drink, Mule Over My Rosemary (RM44.00), is a concoction of gin, ginger beer, Monin watermelon fruit purée and fresh lime juice. The drink is presented in a Mason jar and is garnished with fresh rosemary herb. Like many Hard Rock Cafe collectibles, the Mason jar on sale for RM35.00 with purchase of any cocktail. The Heat Is On (RM44.00) is the next drink on the cocktail lineup. While its appearance and taste are similar to mojito, the ingredients are starkly different. Using vodka as the base, the cocktail is sweetened with Monin almond orgeat, and then infused with jalapeño peppers for the spicy aftertaste. Meanwhile, lemon and mint leaves lend their refreshing aromas. A shot of Jameson Irish Whiskey mixed with Red Bull energy drink results in Yellowson (RM44.00). This cocktail owes its yellowish hue to the latter, whose distinctive scent incites polarizing responses among different people. Cherry and orange wedge are part of the drink's finishing touch. Cool As A Cucumber (RM44.00) is a tequila-based drink blessed with cooling freshness of Monin cucumber syrup. In addition, a cucumber spear literally sticks out of the Mason jar. Grapefruit juice gives an alluring reddish color, while mint leaves provide the refreshing breath. Salt is applied on the rim to give this cocktail a sharper taste. Also prepared in a salt-rimmed glass, Citrus Mary (RM48.00) comprises of Absolut Citron vodka, Cointreau triple sec and Bloody Mary mix. Wedges of lemon and orange give this drink a piquant appeal. Meanwhile, green olives and celery serve primarily aesthetic roles. Many of these vegetarian dishes contain cheese, but vegan versions are also available upon request. 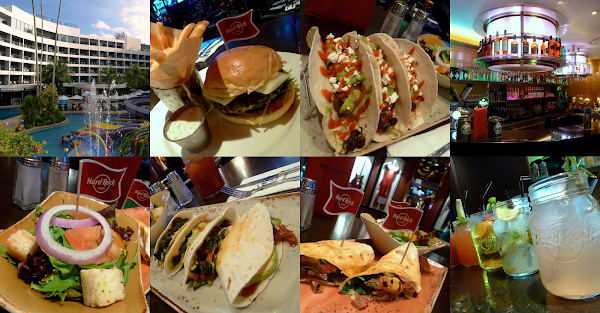 Hard Rock Cafe's kitchen closes at 10:30pm but the bar remains open till closing time. Diners can also participate in an ongoing raffle with a chance to win a brand-new Triumph Bonneville Bobber. To qualify, customers just need to spend RM250.00 or more on a single receipt. This contest runs till 14 December 2017.